Rest Is Found in Jesus. 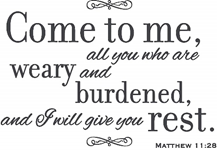 “Come to Me, and I will give you rest.” Matthew 11:28 NLT. Rest. Peace. Calm. Quiet. Refreshed. What calming words in such a busy, stressful world. But there are times when a slower pace, or fewer things on your to do list, or even an extra hour of sleep will not provide the rest you seek. Rest is always and only found in Jesus. Exhaustion does not come in a single form. Our common need includes rest for body, soul, and spirit. Your spirit is revived through frequent and unhurried time in God’s presence. You renew your soul by regular worship and diligent study of God’s Word. You rebuild your strength when you depend on His. You recover optimism by your regular practice of meaningful prayer. I remember a season of life when my days felt too long and my nights too brief. As I sat alone with my Bible late that night, the Holy Spirit brought to my mind an obscure verse. I searched to find its reference. As I found and read that verse, I experienced profound rest in the Lord, strength from His Word, and ample grace. I learned its simple yet powerful truth: “Your strength will equal your days.” Deuteronomy 33:25 NIV. Jesus said, “Therefore, do not worry about tomorrow, for tomorrow will worry about its own things. Sufficient for the day is its own trouble.” Matthew 6:33-34 NKJV. So much about life is learning how to prioritize your life. Fill your thoughts with God Word. Welcome each new day with ample trust and each night empty your day of its cares. God’s Word is clear, ”Cast all your anxiety on Him because He cares for you.” 1 Peter 5:7 NIV. God welcomes what you give Him. He will not take away your concerns without your surrender of them. When you are walking in obedience, strength is given according to your need. Life has a rhythm between work and rest, activity and inactivity, productivity and replenishment.At creation, God Himself modeled the helpful and healthful rhythm of work and rest when he created the earth in six days and rested on the seventh and commanded us to do so as well. Rest and work are seldom equal parts, but they certainly are parts of equal importance. Discover that rhythm and you will have all the strength and energy you need. Ignore that and life doesn’t work as well for you, no matter how much you want it to work or how diligent you are to make it so. Can you identify yourself with what the disciples must have felt? “Then, because so many people were coming and going that they did not even have a chance to eat, Jesus said to them, ‘Come with me to a quiet place and get some rest.’” Mark 6:31 NIV. Even though the disciples were involved in good things for others, that was not enough to make it good for them. Rest is found in Jesus. Life will only change for you when you finally tire of being tired. Only then will you make the necessary changes for that to be different. Burnout is an undeniable fact of today’s high stress, success driven society. The price is inestimable that is exacted on marriages, personal relationships, quality of life, and spiritual fulfillment. Don’t become a statistic. When you do God’s work in God’s way, you will have God’s peace and rest for your soul. Today, I pray for you to keep pace with God, neither hesitating nor hurrying. Failure to Plan Is a Sure Plan to Fail. “May God grant your heart’s desires and make all your plans succeed. ” Psalm 20:4 NLT. Success has essential components to achieve any worthwhile goal – strong desire, deliberate efforts, dedicated purpose, a practical plan, and patient determination. Even the best of plans may not succeed, but if you have no plan, the result is just whatever happens. There is a practical reality I have learned. Failing to plan is planning to fail. Planning is the practical process that envisions success and endeavors to achieve that. A practical and realistic plan expresses your faith in the possibilities of your future. But you and I cannot know the future; only God best knows that. How do you plan for a future you do not foresee? Ask your Father in Heaven. The Bible advises, “If you need wisdom -if you want to know what God wants you to do- ask Him, and He will gladly tell you.” James 1:5 NLT. Practical wisdom can be described as, “the God-given ability to see your situation from God’s point of view.” Imagine the difference such a viewpoint makes. Here are some practical things I have learned. Planning must begin with God. Remember that your future is not yours to determine alone. Wisdom begins with humility. “Submit yourselves, then, to God.” James 4:7 NIV. Over the years, I have observed and learned that the least of God’s plans will be better than the best of mine.Paul was clear,“This ‘foolish’ plan of God is far wiser than the wisest of human plans, and God’s weakness is far stronger than the greatest of human strength.” 1 Corinthians 1:25 NLT. Place your trust in God’s purpose for your life and take time to know what God wants for you and from you. Solomon was wise, “We can make our plans, but the Lord determines our steps.” Proverbs 16:9 NLT. Planning clarifies direction and dictates action. Such a process secures your focus and marshals your resources to best achieve your intent. Without a wise and practical plan, time, effort, and resources will be wasted. The Psalm asks, ”Why do the people waste their time with futile plans?” Psalm 2:1 NLT. The best of plans is futile wherever God was not included. Planning directs your best efforts. Obedience and faithfulness help you realize God’s purpose. Those are not a way to realize your own desires. Isaiah warned a nation, “All your feverish plans are to no avail because you never ask God for help.” Isaiah 22:11 NLT. Sadly, that warning could be said too frequently of any of us. Planning welcomes the help of others. There are very few things, if any, that are best accomplished on your own. “Plans succeed through good counsel; don’t go to war without the advice of others.” Proverbs 20:18 NLT. Planning begins with God’s plans. “For I know the plans I have for you,” says the Lord. “They are plans for your good and not for disaster, to give you a future and a hope.” Jeremiah 29:11 NLT. Here is the thing of which you can be confident: “The plans of the Lord stand firm forever, the purposes of his heart through all generations . . the Lord will work out His plans for my life.” Psalm 33:11 NIV/138:8 NLT. With this prayer, I end where I began. “May God grant your heart’s desires and make all your plans succeed.”Psalm 20:4 NLT. Today, I pray that you desire to have God’s blessings above all else. Love Is a Choice You Make. “Love one another; as I have loved you.” John 13:34 NKJV. At times, love can be challenging for any of us. The Bible would not command us to love if love was not possible for us. Love is not a feeling you have; love is a choice you make. Can anyone learn to love? Most certainly, God’s answer is yes. God set the precedent when He loved you and me – and such love was extended to the whole world. “God showed His great love for us by sending Christ to die for us while we were still sinners.” Romans 5:8 NIV. Real love is always sacrificial. Jesus was clear about His mission. “I have come that they may have life, and that they may have it more abundantly.” John 10:10 NKJV. Abundant life now! Everlasting life forever! “For God so loved the world that He gave His one and only Son, that whoever believes in Him shall not perish but have eternal life.” John 3:16 NKJV. How long has it been since you gratefully reflected on those glorious, foundational, and liberating truths? About love, Jesus’ commandment was clear. “A new commandment I give to you, that you love one another; as I have loved you, that you also love one another.” John 13:34 NKJV. Notice that those words are not a suggestion or a lofty goal beyond your ability to accomplish. How is such love possible? When you experience God’s love, you are changed from the inside out. The ongoing conformation to love others as Jesus loved you is the surest evidence of spiritual transformation. Obedience supplies ability. Is that easy all the time? Definitely not! But would God ever ask you to do something you are incapable of doing without providing His example to guide you and His Holy Spirit to empower you to do so? Love is meant to be shared, not stored until a special occasion. And love is not earned; love is best when freely given. I think the foundation for love is Jesus’ reasonable admonition: “Freely you have received; freely give.” Matthew 10:8 NIV. If ever you have experienced God’s love through Christ by the power of the Spirit, you are capable of profound love. The followers of Jesus marveled at the news of Saul’s conversion was described this way, “He who formerly persecuted us now preaches the faith which he once tried to destroy.” Galatians 1:23 NKJV. Read Acts 27:1-37. The love of God changed a persecutor into a preacher of grace. Love inspires and instills passion. Passionately, Paul prayed, “That I may know Him and the power of His resurrection, and the fellowship of His sufferings, being conformed to His death, 11 if, by any means, I may attain to the resurrection from the dead.” Philippians 3:10 NKJV. Paul longed to know Christ, whatever the sacrifice and suffering required. Notice the multilayered component to an empowered life. (1) the power of His Resurrection, and (2) personal identification with Christ’s sufferings,and (3) embracing the life-changing conformation of Jesus’ selfless surrender. There are no shortcuts. Today, I pray for you to know that God’s love is always transforming.